From his experience of tasting the finest wines from around the world when he was a head sommelier, Paul Lato realised all the greatest wines possessed characteristics of authenticity, harmony, and of course elegance. These are the qualities he set about trying to achieve when he started making wines in California. His ultimate goal was to create wines that are seamless and textural but with enough structure and balance to complement fine cuisine. In order to make wines of the highest calibre, Paul selected unique vineyards that are cared for by talented growers and vineyard managers committed to excellence. He sought to locate and source from not only the best vineyards but also the best blocks within each of these vineyards, a tough ask with demand outstripping supply from the very best growers. During the growing season, yields are restricted to achieve maximum concentration of flavour. Harvesting is always based on physiological ripeness, which changes depending on the vintage characteristics. Cellar work is based on minimal intervention, cleanliness and purity of intention. Because every vintage is different, he does not believe in recipe winemaking. With due respect to science, Paul believes that “true artisanal winemaking is based on intuition, sensitivity and passion”. Keeping the lots small allows for gentle handling throughout the winemaking process. Making only 4000 cases per year, Paul wants his wines to give pleasure and keep the drinkers palate interested until the very last drop from the bottle. 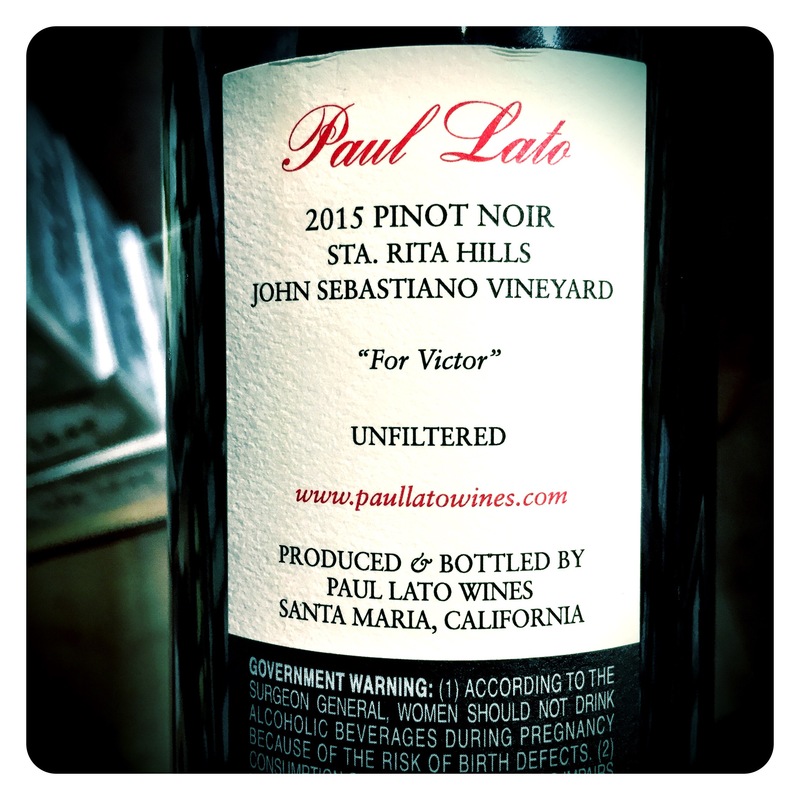 Inevitably, with his high level of attention to detail and quality focus, his wines have garnered high scores from the critics and resulted in a massive cult following, with 90% of his wines produced being sold exclusively through his Paul Lato Wine Club. 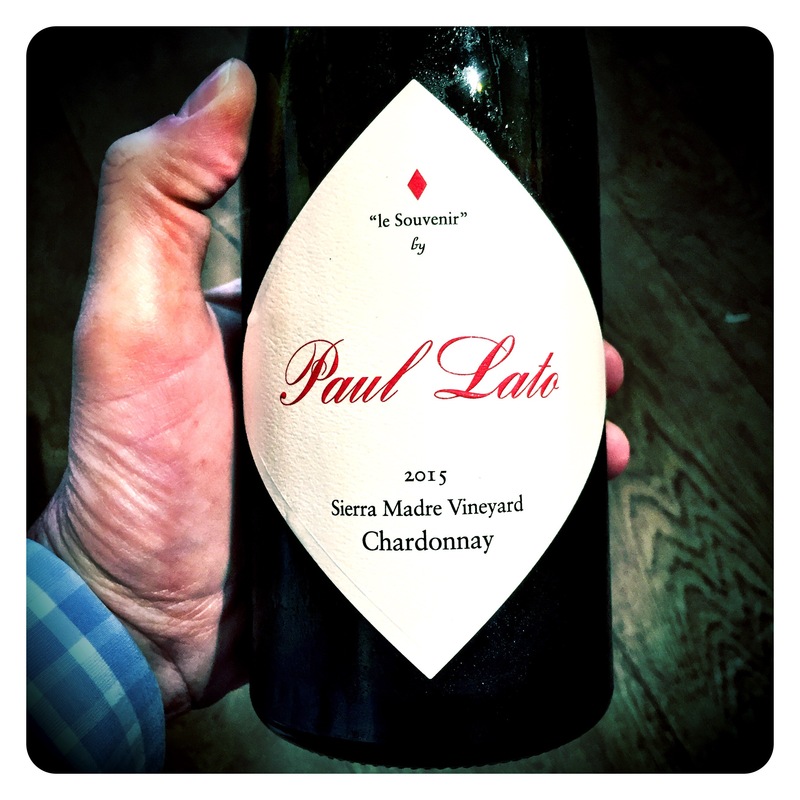 Paul Lato Le Souvenir Sierra Madre Vineyard Chardonnay 2015, 13.9 Abv. A classic Chardonnay which comes from 22 year old Wente clone vines, shows subtle creamy lemon and nutty brûléed citrus fruit lift. Lemon blossom, grapefruit confit and caramel peanut brittle and vanilla bean complexity are all there just teasing the senses. A youthful palate shows nerve, intensity, creamy barley sugar and toffee apple freshness. Intense flavours but nothing over done. Beautiful texture, deliciously vibrant acids, and a subtle minerality lurking beneath the fruit. A very serious multi-dimensional wine that’s also very finely focused. 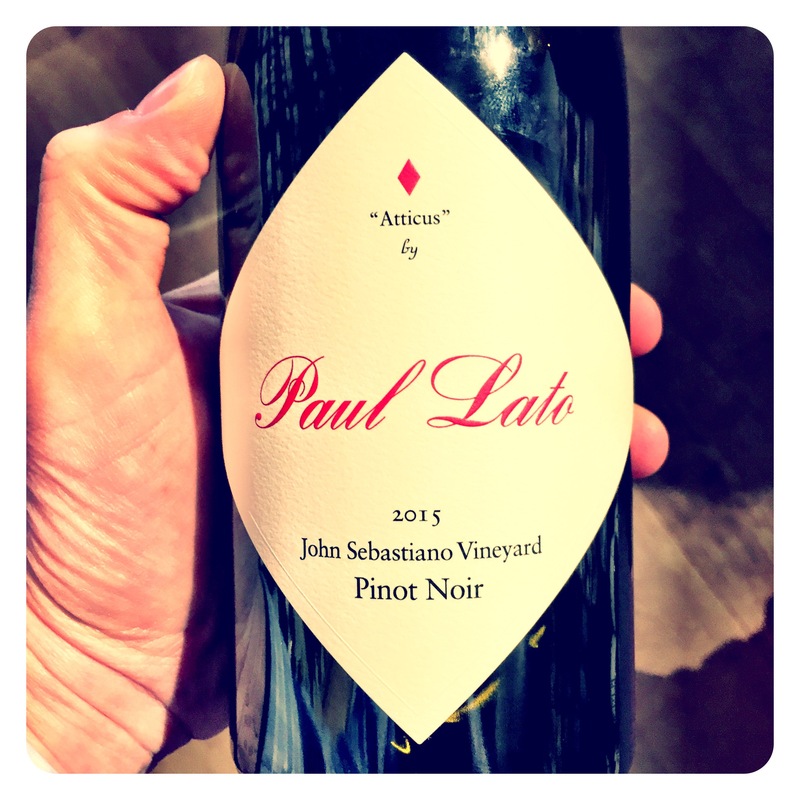 Paul Lato Atticus John Sebastiano Vineyard Pinot Noir 2015, Santa Rita Hills, 14.2 Abv. Tight intense focused aromatics of black cherry, pomegranate, red tart plums, cranberry and savoury baking spice. Plenty of exotic brûléed notes, intense red fruit layers and peppery, seductive flavours. Sleek, elegant mouthfeel, mouth watering fresh acids, a sweet & sour plummy touch, blood oranges and plenty of bright salty, bramble berry fruit nuances. The ethereal Burgundian lacy texture is most impressive. Fabulous wine. 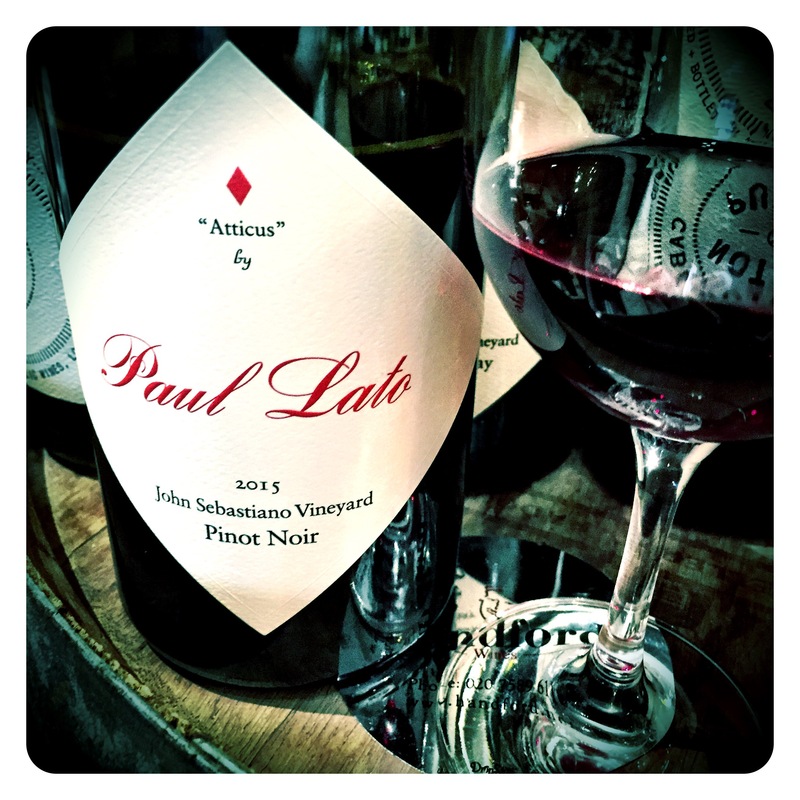 Paul Lato il Padrino Bien Nacido Vineyard Syrah 2014, Santa Rita Hills, 15.4 Abv. Dense, opulent show stopper style immediately evident. Massive intensity, perfume and fragrance showing cherry blossom, sweet jasmine, blueberry muffin, coffee bean, sweet expensive oak spice and dusty, mineral limestone complexity. Super plush, broad and intense, the acids build a sturdy frame from which the exotic fruit finery is displayed. Big, bold, well executed expression with incredible finesse, polish and precision.